Successfully Added 15.4 Inch Portable HD DVD Player - Region Free, TV, FM, Games Emulation, 270 Degree Swivel Screen, Copy Function to your Shopping Cart. Flexible easy to adjust 270 degree rotation makes viewing from any angle easy. Whether it’s to keep the kids entertained on a long journey, or keep boredom away on those long night shifts this DVD player has all the features you could possible need. Take advantage of a compact and easy way to view videos, watch TV, play games, read books or listen to the radio with this all in one portable entertainment system. With a 15.4 inch large screen DVD player you can take portable entertainment to wherever you need and thanks to a 1800mAh battery you get to enjoy up to 2 hours entertainment away from the mains. Capable of reading discs encoded in any country this region free DVD player places no restrictions on what movies you wish to watch and you can chose from CD, DVD, or USB input modes. The built in high resonance stereo speakers bring crystal clear sound while a 1366x768 screen resolution with 16:9 aspect ratio displays films in immersive quality for great enjoyment. The screen can also rotate through 270 degrees making it easy to set up and adjust for almost any viewing angle. With a game emulation function you can download classic arcade hits of the 80’s and 90’s that featured on the games consoles of the time and relive the hours of fun that inspired and entertained a whole generation. Just burn the emulation games to a DVD or CD disc then put it into the player. Plug in the game pad controller and your can recapture your youth or show the kids what real gaming was about. 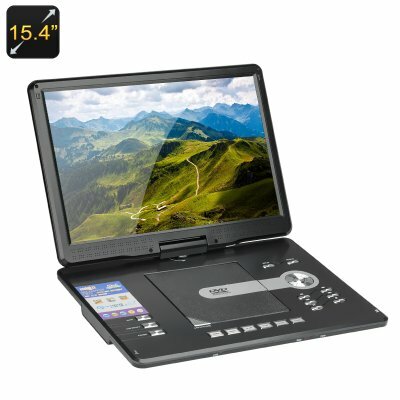 This 15.4 Inch Portable DVD Player comes with a 12 months warranty. Brought to you by the leader in electronic devices as well as wholesale Portable DVD Players, Chinavasion..